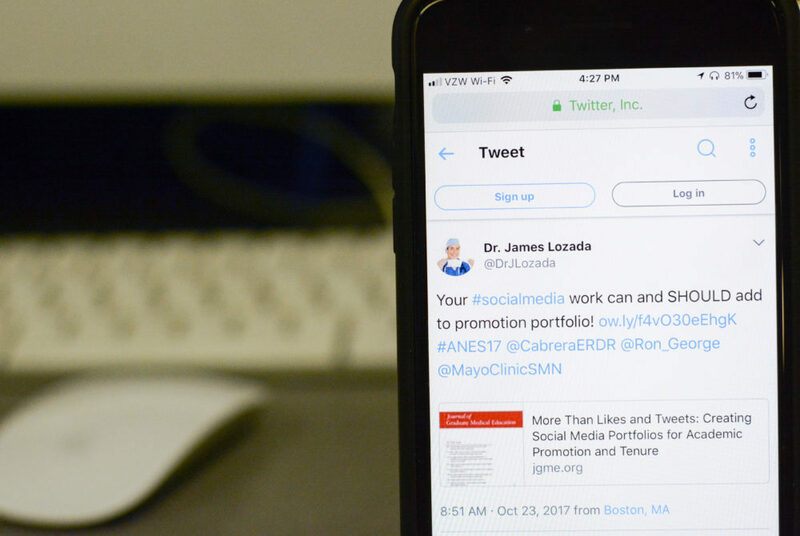 Experts and faculty said publicizing projects on platforms like Facebook, Twitter and Instagram is crucial to gain wide recognition and reach a broader audience. When researchers look to generate buzz for their latest project or to collect data for their next study, they are increasingly turning to social media. At a time when GW is striving to expand its research reputation across the globe and faculty are forced to vie for increasingly competitive federal grants, experts and faculty said publicizing projects on platforms like Facebook, Twitter and Instagram is crucial to gain wide recognition and reach a broader audience. Leo Chalupa, the vice president for research, said he hasn’t issued a directive for faculty to increase their social media use, but utilizing the various platforms to promote research efforts can help raise GW’s image to a world-renowned research hub. Melissa Napolitano, a professor of prevention and community health, exercise and nutrition sciences, said she uses social media to collect information on weight loss and diet to examine obesity prevention and treatment. Through Facebook and Twitter posts, Napolitano said she is able to select more subjects to broaden her sample sizes and communicate her research efforts in a way that the average person can understand her methods and thought process. “Social media can help target particular audiences and deliver a message with ease,” she said. Abdou Youssef, a professor of computer science and former chair of the computer science department, said social media outlets can help the research community promote their work and help individual researchers find faculty and student partners. Although social media can help researchers quickly acquire data and larger sample sizes, Youssef said they should be wary of unintentional data biases. Samples handpicked from places like Twitter and Facebook could be more prone to bias than traditional samples, which can negatively impact the researcher’s results, he said. David Broniatowski, an assistant professor of engineering management and systems engineering, said he doesn’t think social media is effective in finding new people to view his research, but he uses it to keep colleagues up-to-date on his work. Kirsten Brown, an assistant professor of anatomy and regenerative biology, said she uses Instagram and Twitter to share helpful information on anatomy with her students. She manages an Instagram page, where students can further explore concepts discussed in class in an accessible and interactive way. Brown said she also frequently uses Twitter to connect with researchers and draws from a wealth of experts who ask similar research questions, though they may be in different fields. Jon-Patrick Allem, a researcher who specializes in social media and large data samples at the University of Southern California, said promoting research through multiple social media platforms can help researchers communicate their findings to a larger audience in a more concise and attention-grabbing way than a traditional research paper.